Wendy's love of trash to treasure makeovers is well documented throughout the years. 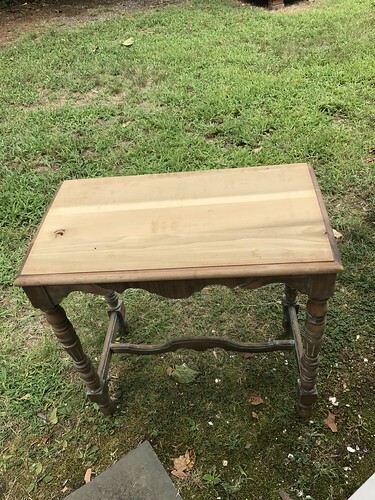 On several occasions throughout our history together my lovely wife has been known to spy a sad, lonely, and abandoned piece of furniture sitting curbside. When the situation is right, she's also well known to pull the car over or stop us in the midst of our evening walk to "rescue" the piece before the trash truck is able to seal its fate. 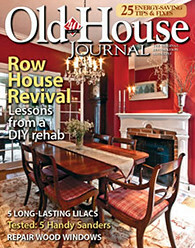 After all, this is exactly how we obtained several pieces of wood furniture, including our favorite little red stool that began life in our home with a much different look. 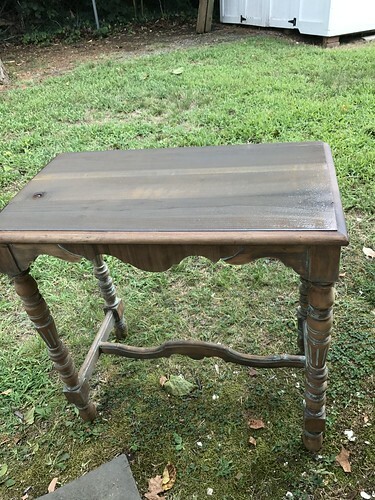 Earlier this summer Wendy's eagle eye for picking struck again, and she gleefully came home with a distressed little end table, left curbside in the rain in front of a home in Del Ray (a nearby neighborhood in Alexandria) and she had a grand vision for it. 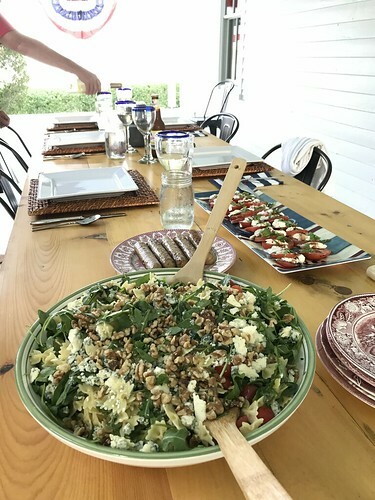 ...to giant multi-course homemade meals. 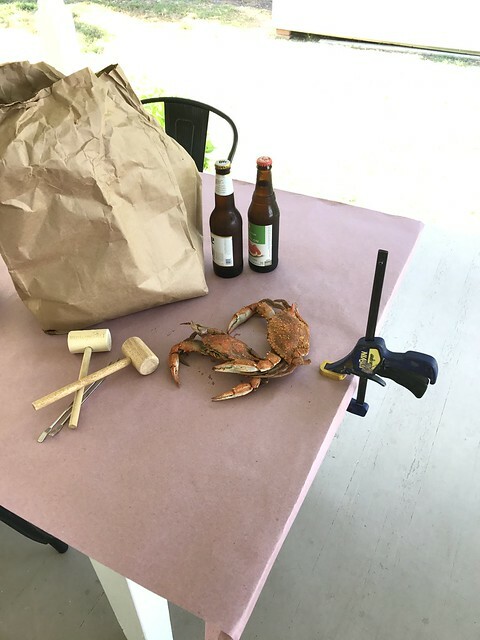 But one of the trickier parts of this set up is transferring everything from the kitchen to the outdoor dining table. The doorways to the side porch are at either end of the porch, and multiple trips in and out take a good deal of time. We do have a window in the kitchen that looks out on the table, but passing things through this window require someone on either side. That is until Wendy found this little table that happened to be the perfect height to act as a passthrough staging area. 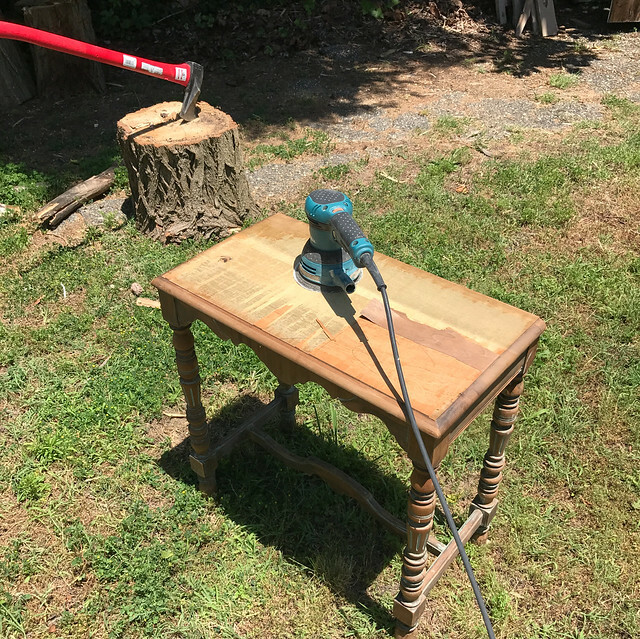 But as you can see, before we could really use this table for its intended purpose, we had to do a little work to clean it up. 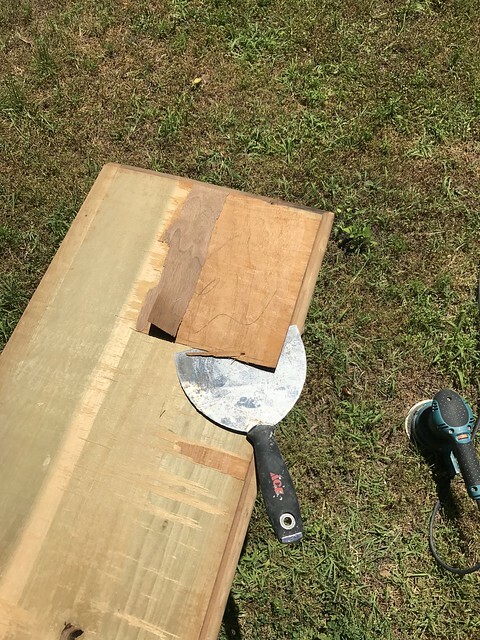 The first step was the removal of the veneer on the top of the table that was already buckling and failing. 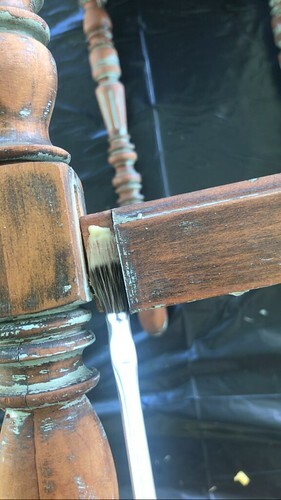 This was the single biggest visible problem on the table, but was easily removed with a taping knife since the adhesive was already giving up. Some of the veneer was left after prying it off, so I grabbed our sander and 80 grit paper to take it all down to the bare wood, then again with 120 grit to smooth it all out. 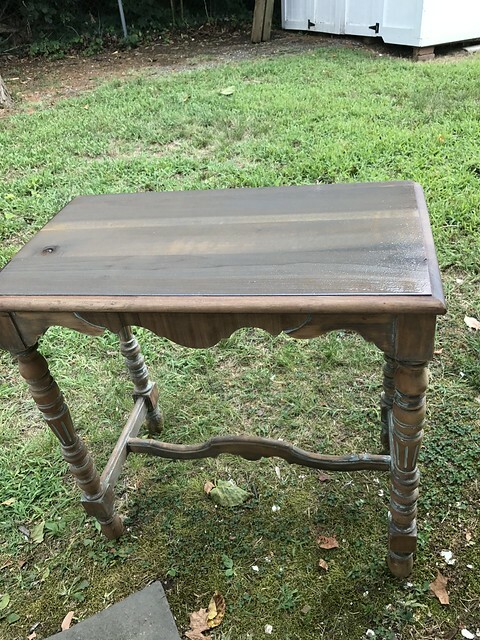 After sanding the top, I didn't want to sand the rest and lose the patina and character, but as you can see, the top was a decidedly different color than the rest of the table. 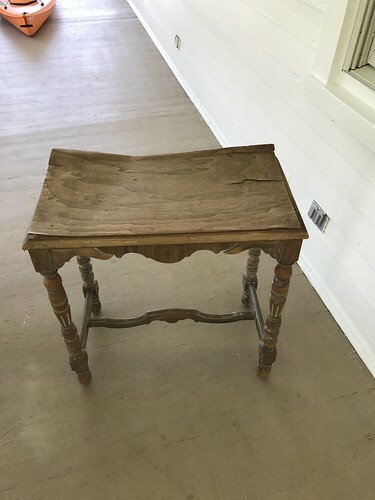 To remedy this situation we decided to stain the top before proceeding with any sealer. The rest of the table already had that slightly weathered look to it so we decided to use some MinWax stain in their Weathered Oak color. 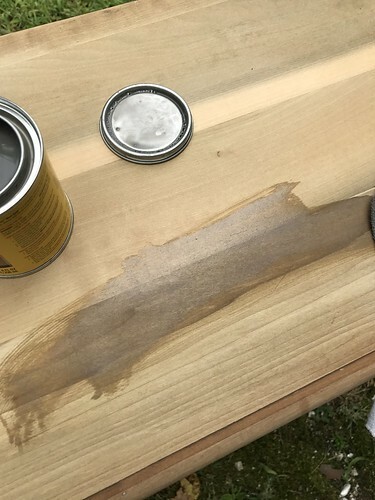 As we began applying the stain we immediately could see we chose the right color. The slight gray tint transformed the raw light color of the table's top to something far more similar to the aged base. 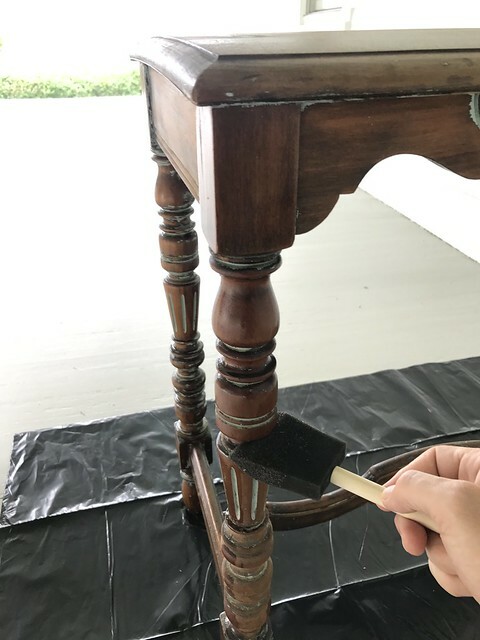 We applied two coats of stain using a foam brush and wiping it off after about 30 minutes. We also allowed a few hours between coats. 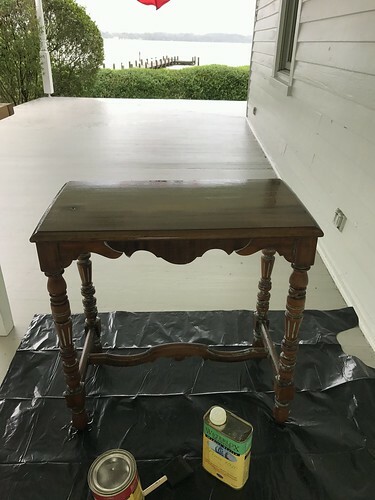 We had to take a long break on the project before continuing and ended up allowing the stain to cure for a week before moving into the top coat. We really only needed to give it 24 hours, but the six days likely didn't hurt. After coming back to the table we were ready for the final step. Since this is an outdoor item that will need to withstand the elements, we decided to give it the same finish as we gave the outdoor dining table. The Waterlox Marine Sealer. The first step in this process is applying the Waterlox Marine Sealer to prep the surface for the finish. The Marine Sealer needs at least one coat and 24 hours before the finish coats can be applied, but we actually went with two for good measure. 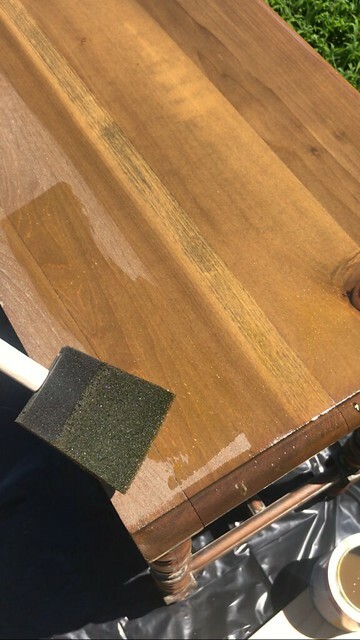 The whole Waterlox process does take a while due to cure time between coats, but it's a classic finish process and is well worth the time. 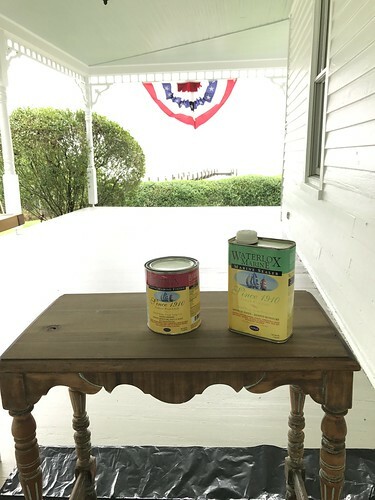 Another 24 hours of allowing the 2nd coat of sealer to dry (plus another week break away from the house) and we were finally ready to apply the Satin Waterlox finish coats. I did notice a small issue with one of the cross supports on one of the table's legs at this point (should have noticed earlier), so I quickly glued it back together to sure things up. 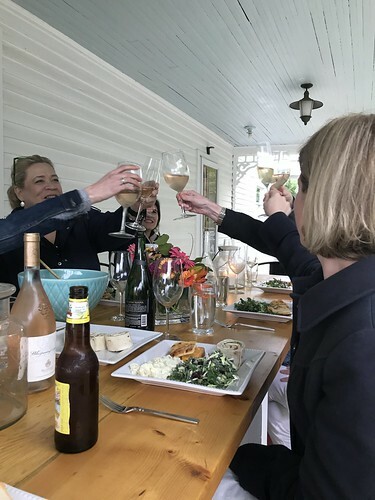 And did you notice in the photo above how the table was painted a beautiful shade of aqua at one point? Wendy likes this detail most of all, as it's a near match to the color of our exterior doors and wraparound porch ceiling. But back to glueing. I clamped the joint while the glue set up and then moved onto applying the finish coats with a foam brush. You can see from the photo that the Waterlox finish does give the wood a richer but slightly yellow look. The stain we used was oil based and the Waterlox finish (and sealer) could be applied over the stain as long as it was fully cured. Given our week long breaks in the process, we were in good shape. 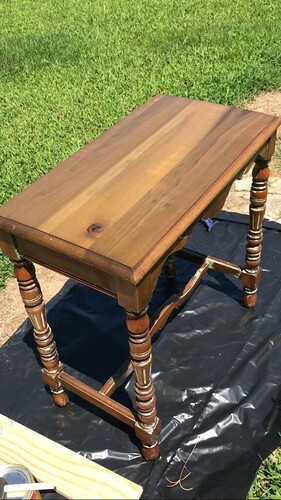 We applied two coats of the Waterlox Sating Marine Finish and allowed it to fully cure. It was looking great and was hard to believe Wendy had picked this broken, wobbly, and peeling piece of furniture from someone's trash pile. 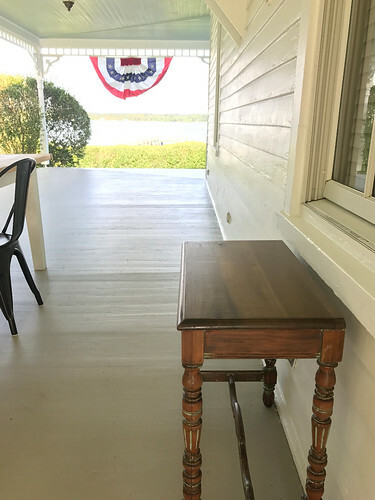 Once the Waterlox had fully cured we popped the little table on the porch below the window from the kitchen. Wendy's trash find is now our official passthrough table. As food, plates, drinks, and anything else is ready in the kitchen to come outside, we just open the window and set the items on the table where someone outside can grab it and place it on the large table. It's a wonderfully convenient pass-through to get the outdoor party started. And since I'm pretty sure we eat outside as much as we eat inside, this free table will get a ton of use. 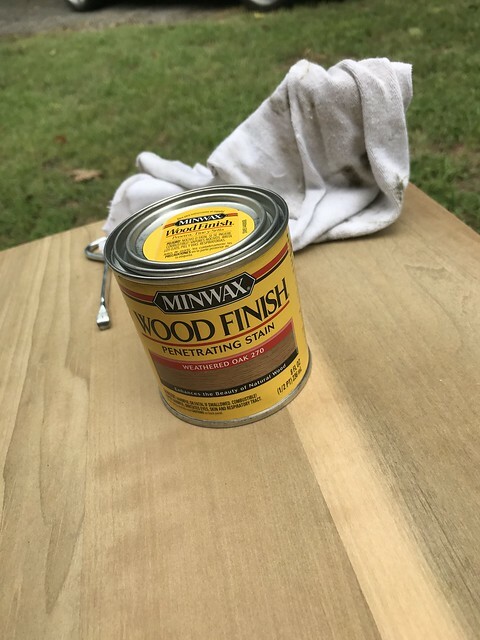 We're really glad we went with the Waterlox Marine finish since we tend to place a lot of pitchers and drinks on this table and condensation tends to build on the surface. Using it for several weeks now we've not had any problems with rings or water stains. 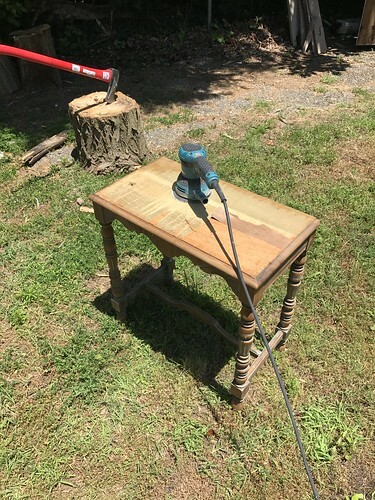 I have to say, I may have my doubts when Wendy occasionally comes home and says "I found something cool on the side of the road on the way home and we're going to make it look awesome!" But now that it's happened several times, and she's always right, I need to keep my skepticism in check. 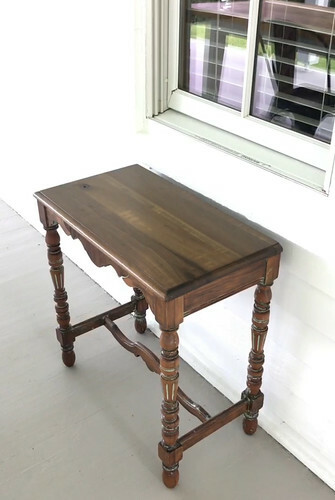 I love how this table turned out and I'm so glad it's now sitting on our porch helping scenes like this play out so wonderfully. 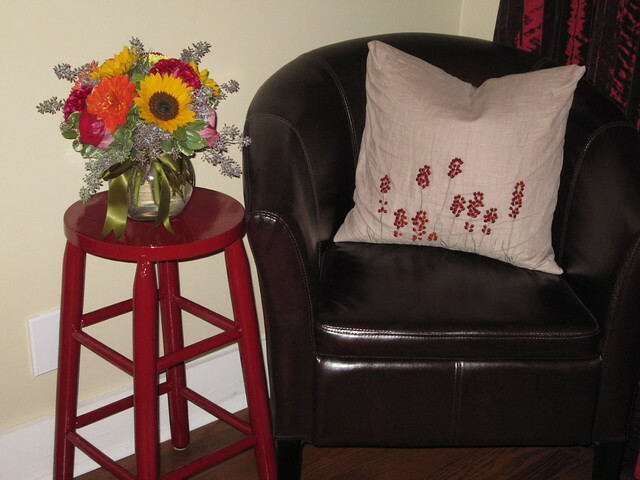 Do you have a partner that's addicted to curbside finds? Perhaps you're the trash hunter? Would love to hear if you'd made any good scores from the curb lately. Fun post. That was a lot of work, but that little table got a great makeover and such a good home. Wendy has a fine eye for seeing the potential. Also in the last photo, where did you find the glass lantern with the metal handle? The lantern is from Target. Wow! What a transformation. Having the vision for a project like this is so great. 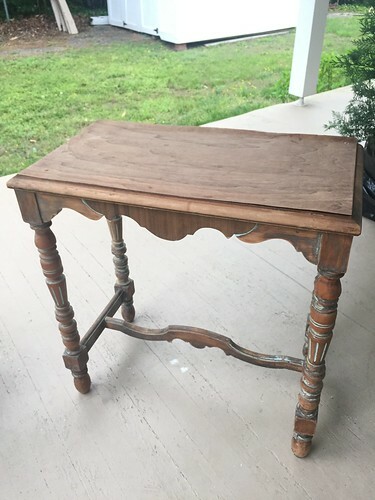 More seriously, I want to ask how time-consuming it is to stain a piece with all those nooks and crannies? And how careful do you have to be not to add extra coats of stain, as you work in/around the nooks and crannies? I ask because I've seen intricate items that I have ideas for, but am put off by (what I imagine to be) the extra care needed to deal with the intricacies. As what they say, "One man's trash is another man's treasure."